If you're of the crafty persuasion, a visit to India can be a sensory overload- for one thing, the place is awash in color. Even in crowded local trains in sweaty Mumbai, you can't help being dazzled by the vibrant sarees and kurtas of women commuters. And then there are the tantalizing fabric and handicraft shops in the bazaar. 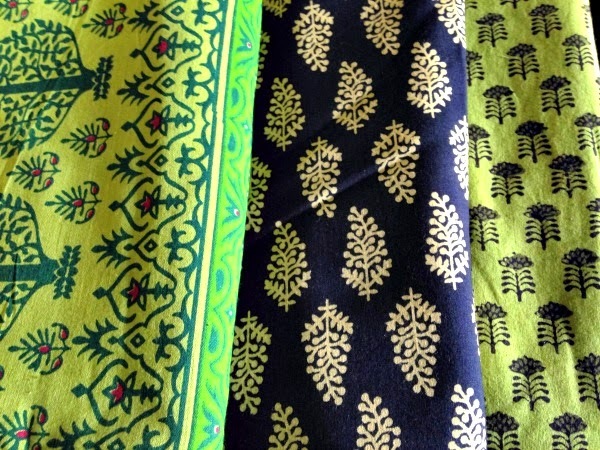 During my trip to Maharashtra this month, I did a bit of shopping for fabric and craft related items- here are my finds. 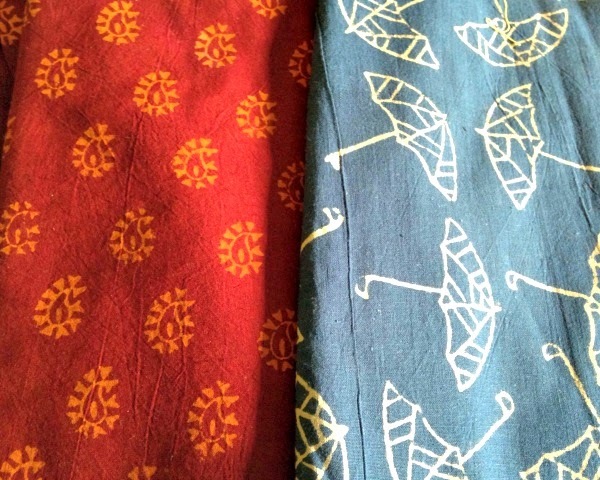 Let me confess that I have a thing (a big thing) for Indian block prints. So although I have no particular projects planned for these fabrics, I couldn't resist buying these. 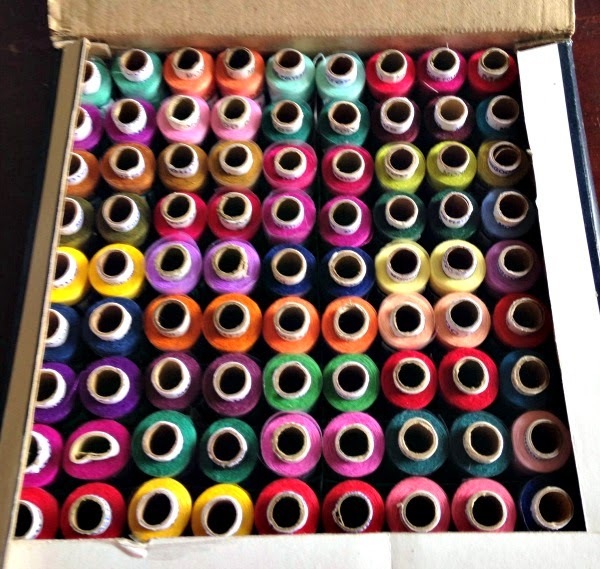 My parents know of a shop that sells very affordable sewing supplies; they got me scissors and thread- 100 spools, 2 each of 50 different shades! I now have a lifetime supply to match every fabric. My mother has a favorite store that sells linens by the kilogram! Many of them are export surpluses and such. There's no saying what you might find in this store, but it is a holy mess, so you just have to get in there and rummage and see what you discover. I've had awesome luck some times. 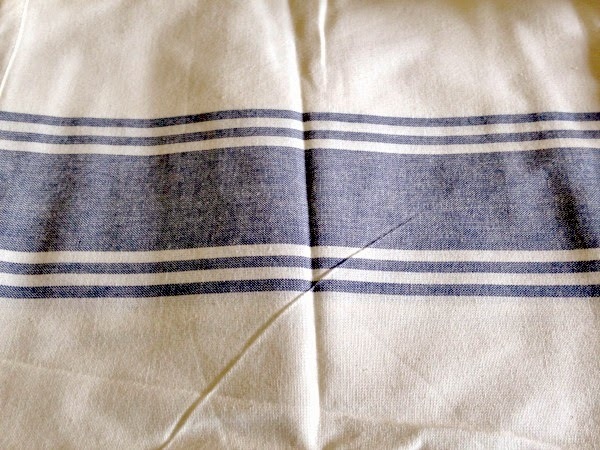 This time wasn't all that great, but I did come away with a large piece of this cotton fabric with blue stripes; I'll cut it into dish towels and maybe embellish them with a little stamped design. One of my aunts is a special educator and organizes art and craft camps for her students. We were at a family get-together and she pulled out a craft kit to entertain the kids. You scratch a design on the smooth black paper and brilliant colors emerge. This was a hit with the kids. And can I just say how much I love crafts that are not messy? I bought a couple of kits to bring back. An old family friend has started a small business where he makes these darling diyas- they hold a tea light and can be used again and again. My cousin works for him occasionally in his sheltered workshop. 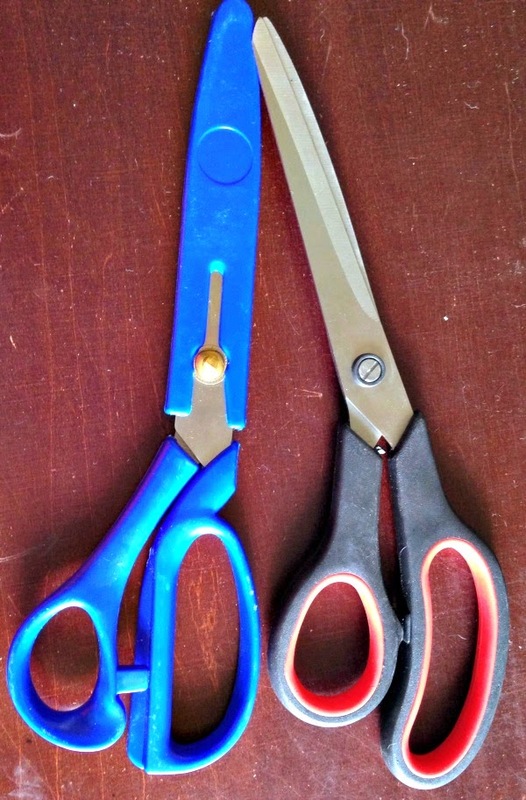 My aunt gave me a couple to use during Diwali. So that's my happy haul. Now to think of something cool to make with all those block prints...any ideas? 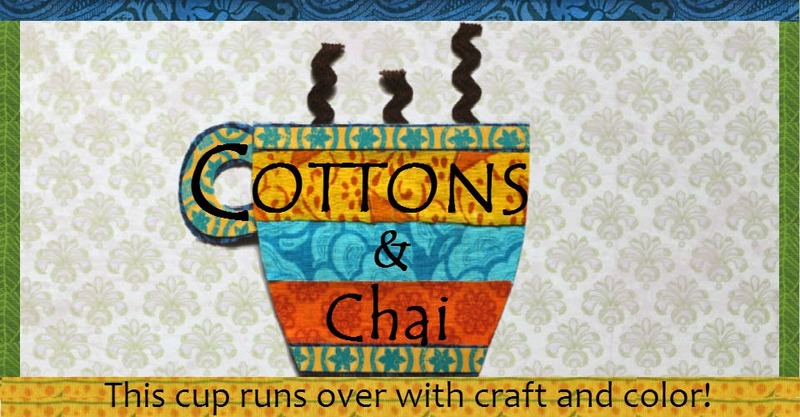 I loved seeing your haul :-) those block print fabrics are so beautiful. 15 years ago one could buy the intricately carved wooden blocks that are used for fabric painting from some hawkers at juhu beach in mumbai for 15-20 Rupees each block, I wish I had purchased some back then. These hawkers would make non-permanent tattoos for 5 Rupees by brushing some colorful ink on them and stamping the blocks on the palm or arm of the customer. :-) It was ideal for those who don't have the patience for a henna tattoo. The box with 100 spools looks amazing and I loved the non messy craft kits, what are they called? 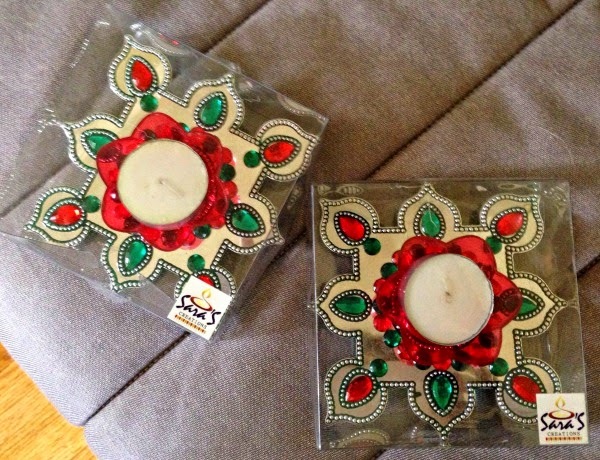 The diyas are beautiful, I have something similar that is arranged together to look like rangoli. Priti- would you believe that I looked in several places for those wooden blocks?! I wanted them for myself (to do fabric stamping) and for a friend who requested them. Did not find them anywhere! Oh well. 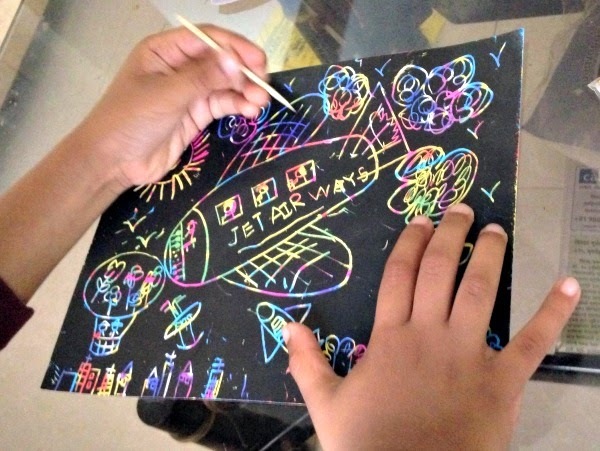 The non messy craft kits are called "scratch art", I believe. Those kits are sold in craft stores in the US too. It is a crayon covered paper with a coat of black paint. You scratch through the black paint to reveal the colors underneath. How I love all your goodies Nupur! 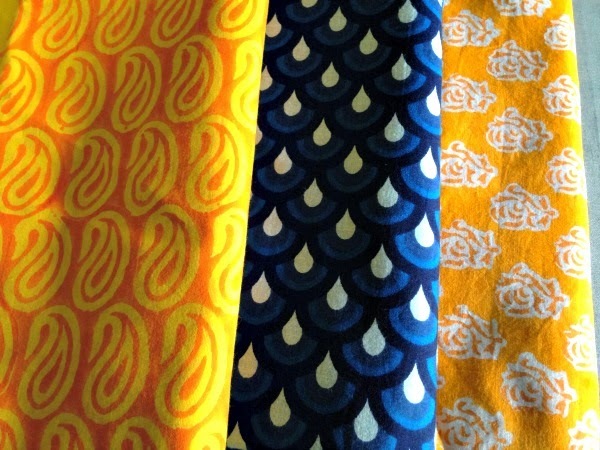 Those fabrics are simply beautiful! A friend gave me a basic sewing machine that her teenage daughter wasn't using any more. I'm going to use your blog as an inspiration to teach myself sewing. Pan Handle Covers: Our 'Hottest' idea yet!